As expected, Janet Yellen of the US Federal Reserve hiked rates today. A 25 basis point hike means the cost to borrow money continues to go up. That’s two rate hikes in the past three months, with several more expected in 2017. So what does this have to do with Vancouver real estate? Well, first off expect fixed rate mortgages here in Canada to continue their upwards climb. US Rate hikes are pushing US bond yields higher which ultimately influence the Canadian 5 year bond yields (which are tied to fixed mortgage rates). A little confusing I know. For more clarification visit this post. 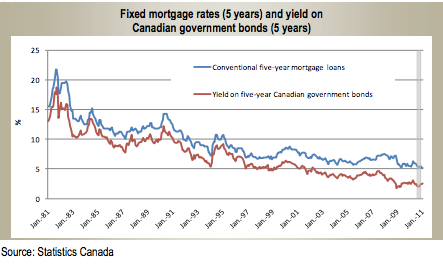 When Canadian 5 year bond yields shoot higher, so too do fixed term mortgages. The two have a very intimate relationship. Yep 5 year Canadian bond yields are rising, it’s upwards movement over the past year is significant. Acquiring a fixed term mortgage here in Vancouver is about to get more expensive which, if history tells us anything, should ease real estate prices. Just don’t expect that happen anytime soon.